Electroconvulsive therapy (ECT) is the fastest and most effective available therapy for MDD. It considered in patients who do not respond to antidepressant drugs or the presence of severe symptoms such as suicidal or homicidal thoughts, agitation, or stupor. Although ECT is a relatively safe therapeutic strategy overall, it causes significant complications, including headache, cognitive impairment, delirium, and musculoskeletal pain, leading the psychiatrists to look for other safer antidepressant agents with rapid-onset response. A study comparing the rapid antidepressant effects of ketamine and ECT found that the effects were comparable for 3 days. This suggests that ketamine may be a suitable alternative to ECT because of the rapid antidepressant effects. Data show that there is little documentation in comparing the antidepressant effects of ketamine and ECT. We designed this clinical trial to compare the speed of onset and duration of antidepressant effects of these two- antidepressant therapies and their side effects. This study was conducted in 2010–2011 and published in 2012 in Persian language with an abstract in English. It published in English to better serve English speaking researchers. In a blinded randomized clinical trial in 2010–2011, by reviewing relatively similar studies and general patterns of clinical trials, 40 eligible patients with depression admitted to the ECT health center of Khorshid Hospital in Isfahan, Iran. Eight patients excluded because they were reluctant to participate in the study and did not match the inclusion criteria. Thirty-two patients were selected for the study. They were allocated randomly in two groups of intervention and control using block design randomization method. The objectives of the study were explained clearly to the participants, and they all signed written consent forms. The study was conducted in accordance with the ethical guidelines set by the Ethics Committee of the Isfahan University of Medical Sciences and registered in the Iranian Registry of Clinical Trials Center (IRCT201104092266N2). Inclusion criteria were being 19–59 years old, having no history of psychosis, having no drug abuse in the past 3 months, not being pregnant or breastfeeding, having no serious physical conditions including liver, kidney, digestive, respiratory, cardiovascular, endocrine, neurologic, or hematologic diseases (based on medical counseling and paraclinical assessments), and not having untreated hypothyroidism. Exclusion criteria were having delirium following ketamine injection or unwillingness to continue participating in the study. Before the start of the intervention, a trained psychiatry resident evaluated the baseline depression severity and memory function in both the groups using a structured interview based on the Hamilton Depression Rating Scale (HDRS) and the Wechsler Memory Scale (WMS). The ECT group received an intravenous (IV) injection of thiopental 3 mg/kg, for induction of general anesthesia, along with atropine 0.25 mg and succinylcholine 20 mg. Then, ECT was performed through the placement of bitemporal electrodes, and 20–100 joules of electric energy was applied (based on the patient response) using a Thymatron® DGx machine to induce generalized tonic–clonic seizures for at least 25 s. The participants' vital signs were monitored throughout the procedure. The ketamine group received ketamine hydrochloride produced by Rotexmedica, 0.5 mg/kg in 50 cc of normal saline infused over 40 min through an IV pump or a microdrip set, while their electrocardiogram and blood pressure and oxygen saturation monitored constantly. Patients in both the groups were under the prescription of ECT or ketamine twice a week up to the complete remission of depressive symptoms. To evaluate the changes in depression severity, researchers administered HDRS at baseline, before each treatment session, and four time points post treatment (week 1 and months 1, 2, and 3). The changes in memory functions of patients were evaluated using WMS at baseline, 1 week, and 1 month after the last treatment session. The ECT or ketamine complications evaluated before each treatment session using a checklist of ketamine and ECT side effects respectively extracted by the authors. The patients and evaluator were blinded to the method of treatment. All patients referred back to the referring physicians for treatment follow-ups, and subsequent evaluations regarding the depressive sign and symptoms were done through telephone calls using HDRS. The collected data were analyzed with SPSS version 18 software (Chicago: SPSS Inc. IBM Corp). The results of quantitative variables were reported as mean ± standard deviation and the qualitative variables were presented as frequency (percentage). The changes in depression severity and memory function scores were analyzed with the repeated measures ANOVA test. We used the Chi-square test to compare the frequency of complications between the study groups. The significance level for the tests was 0.05. Thirty-two patients were enrolled in the study and assigned to two equal groups; however, only 12 in the ECT group and 10 in the ketamine group completed the trial [Figure 1]. The mean age of the participants in the ECT group was 36.4 ± 14.1 years and that of the ketamine group was 41.7 ± 12.9. There was no significant difference between the two groups in age (P > 0.05). Females constituted 36% of all the participants, and there was no significant difference in terms of gender composition of the groups (ECT: n = 5, 33.3%; ketamine: n = 4, 40%; P > 0.5). [Table 1] presents the mean scores for HDRS and WMS at baseline, during the treatment, and follow-up. There was no significant difference between the two groups at different stages. [Table 2] shows the mean frequencies of the side effects reported by the patients during the treatment for depression with ECT or IV ketamine. One case of extended seizure occurred in the ECT group, and nystagmus and increased respiration and heart rate, 1 case each, occurred in the group receiving IV ketamine. The present study aimed to compare the efficacy of ECT versus IV ketamine infusion for controlling depressive symptoms in patients who were candidates for ECT. The comparison of HDRS score changes in the groups [Table 1] suggests that the reduction in depression scores was more rapid in the ketamine group than in the ECT group, although it gradually returned to baseline values within 3 months after cessation of the therapy. It shows that antidepressant effect of IV ketamine appears rapidly compared to ECT, but it had less durability. This means that the repeated dose of ketamine may be needed. Ghasemi et al. compared the antidepressant effects of IV ketamine and ECT; however, they followed the study participants only for 3 days, which do not seem to be enough for drawing a firm conclusion. A number of side effects occurred in the patients who received ketamine treatment. These included blurry vision, vertigo, diplopia, numbness on one side of the body, and depersonalization. It is also possible that other side effects, such as positive psychotic symptoms, might have appeared transiently or with modest severity; therefore, they were overlooked by the researchers. Patients in the ECT group also experienced complications including headache and muscle and bone pain, which were significant and were unique to this mode of treatment. The conclusion is that ketamine would be a suitable alternative to ECT for inducing rapid symptom relief in patients with severe depression symptoms who need urgent psychiatric care. Memory function, as measured with the scores on WMS, displayed a decreasing pattern in the ECT group. The mean WMS scores in various time points were higher in the ketamine group compared with the ECT group. These differences, although not statistically significant, might bear clinical significance and show that ketamine infusion not only did not have adverse effects on memory (a major concern in ECT) but also had a protective effect on memory. The results of the comparison of side effects of the two intervention methods in [Table 2] showed that headache; muscle pain, and joint pain in ECT group were significantly more than ketamine group, while blurry vision, vertigo, double vision, half body numbness, and depersonalization were more common in ketamine group compared to ECT group. Further research should aim to determine the long-term efficacy of ketamine, examine the effects of repeated doses, and evaluate the efficacy of other routs of drug administration in patients with various degrees of depression. Larger samples are needed to get results that are more reliable and draw definitive conclusions. The treatment with IV ketamine in depressed people has the same antidepressant effects as the treatment with ECT, with the added benefit that it may also have a protective effect on memory. The main limitation of this study was the small number of patients; we are going to repeat the study with a larger number of participants. Hereby, we thank all the participants and the staff in ECT center in Khorshid Hospital of Isfahan University of Medical Science. Sadock BJ, Sadock VA, Ruiz P. Mood disorders. Synopsis of Psychiatry. 11th ed., Vol. 1. Philaledphia: Lippincott Williams & Wilkins; 2015. p. 347. Jaso BA, Niciu MJ, Iadarola ND, Lally N, Richards EM, Park M, et al. Therapeutic modulation of glutamate receptors in major depressive disorder. Curr Neuropharmacol 2017;15:57-70. Abdallah CG, Jiang L, De Feyter HM, Fasula M, Krystal JH, Rothman DL, et al. Glutamate metabolism in major depressive disorder. Am J Psychiatry 2014;171:1320-7. Abdallah CG, Adams TG, Kelmendi B, Esterlis I, Sanacora G, Krystal JH, et al. Ketamine's mechanism of action: A path to rapid-acting antidepressants. Depress Anxiety 2016;33:689-97. Sadock BJ, Sadock VA, Ruiz P. Brain stimulation methods. Synopsis of Psychiatry. 11th ed., Vol. 2. Philaledphia: Lippincott Williams & Wilkins; 2015. p. 1067. Sadock BJ, Sadock VA, Ruiz P. Brain stimulation methods. Synopsis of Psychiatry. 11th ed., Vol. 2. Philaledphia: Lippincott Williams & Wilkins; 2015. p. 1071-2. Zarate CA Jr., Singh JB, Carlson PJ, Brutsche NE, Ameli R, Luckenbaugh DA, et al. Arandomized trial of an N-methyl-D-aspartate antagonist in treatment-resistant major depression. Arch Gen Psychiatry 2006;63:856-64. Fond G, Loundou A, Rabu C, Macgregor A, Lançon C, Brittner M, et al. Ketamine administration in depressive disorders: A systematic review and meta-analysis. Psychopharmacology (Berl) 2014;231:3663-76. Thase M. Mood disorders: Neurobiology. In: Sadock BJ, Sadock VA, Ruiz P, editors. Kaplan and Sadock's Comprehensive Textbook of Psychiatry. 9th ed., Vol. 1. Philadelphia: Lippincott Willams & Wilkins; 2009. p. 1670. Aan Het Rot M, Collins KA, Murrough JW, Perez AM, Reich DL, Charney DS, et al. 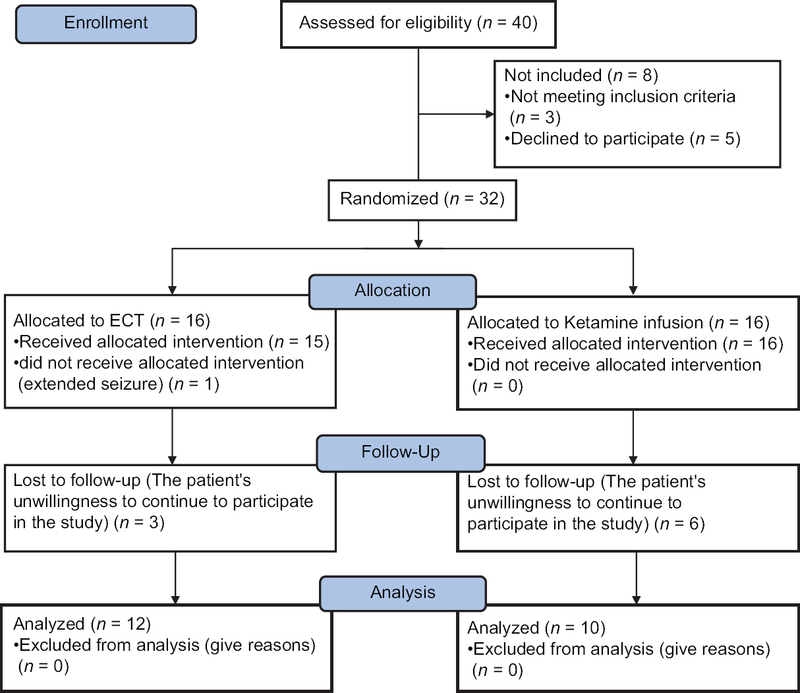 Safety and efficacy of repeated-dose intravenous ketamine for treatment-resistant depression. Biol Psychiatry 2010;67:139-45. Alberich S, Martínez-Cengotitabengoa M, López P, Zorrilla I, Núñez N, Vieta E, et al. Efficacy and safety of ketamine in bipolar depression: A systematic review. Rev Psiquiatr Salud Ment 2017;10:104-12. Chilukuri H, Reddy NP, Pathapati RM, Manu AN, Jollu S, Shaik AB, et al. Acute antidepressant effects of intramuscular versus intravenous ketamine. Indian J Psychol Med 2014;36:71-6. Talbot JN, Geffert LM, Jorvig JE, Goldstein RI, Nielsen CL, Wolters NE, et al. Rapid and sustained antidepressant properties of an NMDA antagonist/monoamine reuptake inhibitor identified via transporter-based virtual screening. Pharmacol Biochem Behav 2016;150-151:22-30. Maeng S, Zarate CA Jr. The role of glutamate in mood disorders: Results from the ketamine in major depression study and the presumed cellular mechanism underlying its antidepressant effects. Curr Psychiatry Rep 2007;9:467-74. Ghasemi M, Kazemi MH, Yoosefi A, Ghasemi A, Paragomi P, Amini H, et al. Rapid antidepressant effects of repeated doses of ketamine compared with electroconvulsive therapy in hospitalized patients with major depressive disorder. Psychiatry Res 2014;215:355-61. Kheirabadi GR, Vafaie M, Attari A. Intravenous ketamine therapy vs. electroconvulsive therapy in depressive cases. J Isfahan Med Sch 2012;29:1289-97.